The draw ceremony will give Russia the chance to showcase the cities and stadiums that will host the 32 teams next June and July. The World Cup trophy is on display during the "Behind the scenes of the Final Draw" event on the eve on the final draw for the 2018 FIFA World Cup Russia, in Moscow on November 29, 2017. Russia will host the 2018 World Cup draw on Friday, the glittering ceremony providing a welcome distraction to the unrelenting diet of doping and corruption news that has sullied the nation's sporting reputation in recent years. The draw ceremony will give Russia the chance to showcase the cities and stadiums that will host the 32 teams next June and July, with 1986 Golden Boot winner Gary Lineker and Russian sports journalist Maria Komandnaya the main presenters. In a new simplified format, the teams will be placed in pots one to four from highest to lowest FIFA ranking with the exception of Russia, the lowest-ranked team in the tournament, which is automatically placed in pot one alongside the top seeds. 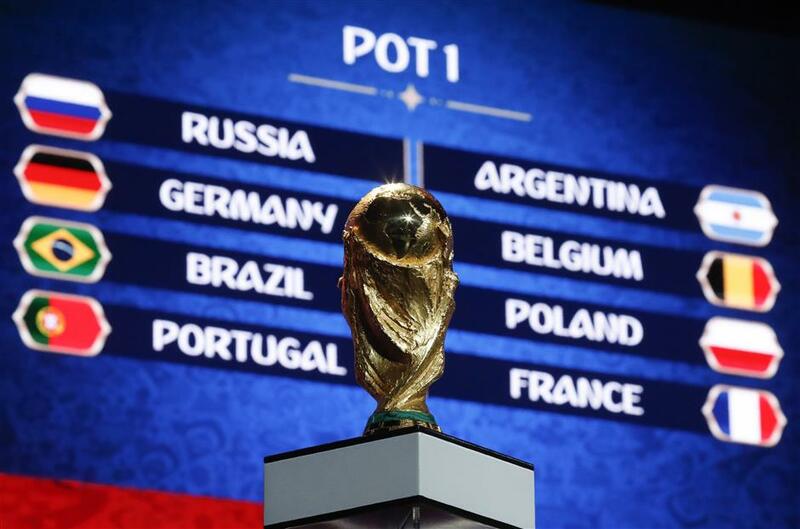 Each pot will be emptied one by one into eight groups — Group A to Group H — which will contain four teams each. Two non-European teams from the same confederation cannot be in the same group to avoid geographic clashes. While the draw ceremony, which the Kremlin said President Vladimir Putin could attend, will focus on the positive aspects of the tournament, it will also serve as a reminder of the potential problems, notably concerns over racist and discriminatory behavior and hooliganism. The authorities have said that World Cup preparations are generally on track but there have been some construction delays, including on the new stadium in Samara. Work on the 45,000-seat venue, which will host four group stage matches, a match in the round-of-16 and a quarterfinal, has been plagued by delays over recent months. Authorities have pledged the venue would be completed on time. FIFA said that around 750,000 tickets have been allocated in the first phase of sales, with the second phase beginning next week. Russian fans have acquired the most tickets, with American fans in second place even though the country did not qualify for the tournament. Brazil, Germany, China and Mexico are also among the leading nations for purchases, FIFA said. "We're happy with the number of tickets we've allocated," Falk Eller, the head of FIFA ticketing, said on Thursday. "Of course we are also glad that the operation went quite well, no technical glitches, no problems." All World Cup ticket holders are required to obtain a personalized fan-ID, allowing authorities to screen them and keep hooligans away from matches.